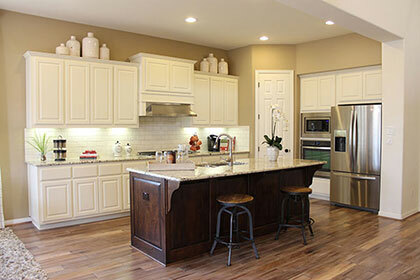 The two most important choices you will make in any kitchen upgrade are the countertops and the cabinets. They are going to be the focal point of the whole room; they are the most visible features and the ones that will be used the hardest. A complementary kitchen has countertops and cabinetry that are similar in shade and complement each other. Of course, this option can range from all white to all black, but there are also some beautiful complementary cabinet and granite combinations in between that you may not have considered. Of course, the most recognizable contrasting granite and cabinet combinations are the timeless black and white looks. Contrast adds energy and a bit of fun to the whole room. - Magma Gold Granite on natural oak cabinets. As you can see from these two examples, the contrast can rely on the simplicity of the two elements or it can serve to highlight the bold pattern of an exotic granite like Magma Gold. Another way to approach matching your cabinets and granite countertops is to look for cabinets that will highlight a certain color in your stone. Lastly, if you still are unsure of the best combination for your kitchen, here are some practical tips for matching your granite, marble, or quartz to your cabinets. - If you choosing a granite for pre-existing cabinets, grab a top drawer from your cabinets, and take it along to your local stone fabricator. This will help you get a feel for how well the cabinet agrees with different slabs of granite or quartz. - If you've already picked out your granite slab, but still need to find the right cabinet, don't be afraid to order lots of samples from the cabinet company. The fees are worth it. Then set up a time when you can visit your fabricator and place all the cabinet samples with your stone color to see which works best.